Horror movie fans are surely rejoicing that Jordan Peele's highly anticipated second film Us has finally arrived. It's hitting theaters almost exactly two years after Get Out, which awarded Peele with an Oscar for Best Original Screenplay. Chris Washington's (Daniel Kaluuya) unforgettable weekend at his girlfriend Rose Armitage's (Allison Williams) home as well as his journey into and escape from The Sunken Place have been etched into our minds for good after seeing it. Us had a lot to live up to for Peele fans, and reviews are showing that it surely did just that. It already has a 98% on Rotten Tomatoes and has been given the stamp of approval by a fair share of critics. While Us may look just as scary as Get Out, Peele has some tidbits of information for anyone too afraid to buy a ticket at the theater. Peele chatted with E! News at the premiere on Tuesday night and discussed the film as well as why he loved working with its stars Lupita Nyong'o and Winston Duke. Peele hopes that moviegoers put their apprehension aside when strolling up to the theater because there is some light amid the frightening parts. "I think this is a scarier movie than Get Out, but I'm being told that people who don't like horror movies still like this movie," he told us. "I think the fun outweighs the scary." It may be time to say "get out!" to any horror movie fears for the sake of Us. The former Key and Peele star said that having Nyong'o and Duke in his newest film has been a "dream." He explained, "They're Yale grads, they know how to dig and find levels to their characters that you didn't know were there. It was a magical collaboration." Just like Get Out was layered with societal and cultural undertones and lessons, Us is no different and he does it that way on purpose. 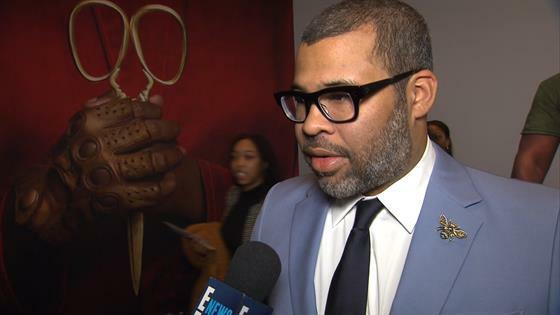 "Any time there's an Us, there's a Them, so I'm always going to be pointing my finger at society and what our societal equals are," Peele told E! News. Nyong'o has been repping the color red at a number of public appearances related to the film. At the London premiere, for instance, she wore red contact lenses that matched her red sequin dress. The hue is very prevalent throughout the film, and she told us on Tuesday that she wants to keep her looks "on-theme." The Black Panther actress reciprocated Peele's praise and called him an "incredible director." Although the film itself wasn't scary to make, she explained, "it was a very scary place that I had to go in order to get into my character and stay in it for as long as I did." Nyong'o said the set was actually very "joyful." 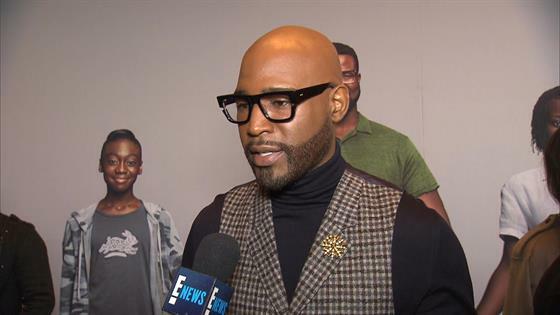 Queer Eye's Karamo Brown shared his enthusiasm for horror films and reality TV with E! News at the premiere as well. It turns out that the Netflix star is a huge fan of reality shows, especially the Real Housewives franchise because he loves "the psychology behind it." "I think a lot of people miss that. These women are really dealing with some real, emotional issues and putting it out there for the world. I think if people could really evaluate what they're doing, I think people could really grow and have better lives, but sometimes we just get caught up in the drama," Brown said. There was one Housewife in particular that inspired him to do make an addition to his family: Lisa Vanderpump. The Real Housewives of Beverly Hills star is currently ensnared in a situation being dubbed "puppygate" and all of it gave Brown the extra push to adopt a puppy himself. He gave E! News the exclusive on this info and joked that his canine's name is Elizabeth Diane, "but we're calling her Lizzie." Prepare for her social media intro some time in the very near future. Brown, too, applauded Peele for his work and called him "one of the most amazing people of our time" and a "genius." In case you have any questions about horror movies, Brown may be your go-to because he said he's seen them all—Jason, Nightmare on Elm Street, It, Saw, etc.—"14 million times." Us hits theaters March 22.